South African hospitality group Singita Game Reserves is now firmly at the top of the industry after walking off with the honours in the 2011 US Travel + Leisure World’s Best Awards readers’ survey. 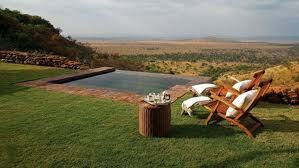 Singita’s safari hotels and lodges were rated against top competition from around the world. Its Grumeti Reserves, situated close to the Serengeti National Park in Tanzania, came in at number one on Travel + Leisure World’s list of 100 top hotels. Also, Singita’s flagship Sabi Sand, located within the greater boundaries of the world-famous Kruger National Park, was ranked at number two. Sabi Sand features Singita’s original lodges, Singita Ebony and Singita Boulders, as well as the Singita Castleton, an exclusive-use facility. As if this wasn’t enough, the Singita Kruger National Park, overlooking the N’wanetsi River in the park’s northern region, rounded off the honours for the group by taking the 39th spot on the list, and was also named the best Hotel Spa in Africa and the Middle East. The Travel + Leisure World’s Best Awards are given to top hotels, destinations, airlines, cruises, outfitters and transportation companies in the world. The winners are chosen by readers in a survey where they are rated on a scale of one to five, with five being excellent. The winners of this year’s survey, the 16th edition, were announced on 7 July on US television channel NBC’s Today Show. They were due to receive their awards at a ceremony in Los Angeles on 14 July. The group practises so-called modern conservation, said Rossouw. She described the concept as “a finely tuned relationship between wildlife, local communities and tourism”. Singita is committed to tourism that delivers a high value but leaves a low impact on the environment, meaning that habitats are sensitively managed. As a result, animal populations are thriving in Singita areas. As an example, said Roussouw, a mere eight years ago hardly an animal was seen in Grumeti, but today it boasts the most prolific game populations in East Africa. “We spend more on wildlife projects and community development than anyone else,” said Rousseau. She expressed her gratitude at the honour of being voted a world leader by some of the most discerning travellers to be found anywhere. The results of the survey attest to the splendour of Africa’s natural scenery, the attraction of its great hospitability, and the enchantment it leaves on those who have travelled and stayed there. Singita describes the impact of its destinations on guests as “nothing short of life changing”. The group’s luxury lodges can be found in South Africa, Tanzania and Zimbabwe. In South Africa, the Singita Ebony and Singita Boulders lie within the world’s best leopard viewing area, while the Singita Castleton, a private six-roomed villa, is situated close to one of the most frequented waterholes in the Kruger National Park. Guests can spot the Big Five – lion; leopard; rhino; elephant and buffalo – at these locations. In Tanzania, home of the world’s best hotel; millions of wildebeest can be seen during the migration season as the hotel is located on a prime viewing site along the animals’ annual route. In Zimbabwe, Malilangwe Wildlife Reserve is a haven for endangered species like the black rhino. The reserve has a vast collection of baobab trees and offers breathtaking views of the Malilangwe Dam.